Businesses of all sizes are cutting outgoings where they can to stay profitable, and reducing the cost of fleet management through contract van hire is one strategy hundreds of firms are opting for. 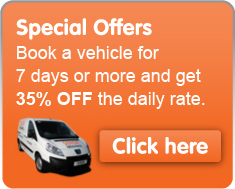 So why is contract van hire is so popular among businesses? The simple answer is that keeping commercial vehicles on the road can become extremely expensive if you buy all of your vehicles outright and then continue to pay fuel, taxes and repairs for as long as you own them. With contract van hire you can walk away with a full fleet of new or almost-new vehicles for just one monthly payment, which covers all costs for the length of time you wish to keep the vans and the mileage you expect to use. Knowing exactly what your fleet will cost you from month to month means you can budget ahead, and as you can opt for maintenance, roadside rescue and the provision of relief vehicles to be added to your contract, there will be no nasty surprises on your bill. Contract van hire also offers tax benefits, as VAT is claimed back on our purchase of the vehicle and those savings are passed on to you. You can claim up to 100% of VAT back on your vehicle if you use it for business purposes only. When you buy a fleet of vans, you are investing a huge amount of your business’s money into an asset which will depreciate in value the longer it is used. Our effective sourcing techniques mean we can buy and rent vans at a lower cost and we accurately assess the van’s resale value, so we can offer you better returns on your investment over the period of your contract. Senior Vehicle Rental is a well established local company with an excellent reputation we have an extensive range of vans to offer, in small, medium and large vans, Lutons, drop-sided and curtain-sided vehicles. We are confident we can provide a great deal regardless of your requirements, so browse our selection or contact us now to find out what you could save.